Trusts have been around for many centuries to protect wealthy people from inheritance taxes and probate processes of various sorts. In recent years, trusts have become increasingly common for middle-class people for the same purposes - most particularly for avoiding probate, along with its inherent court paperwork, court and attorney fees, and all the accompanying delays and lack of privacy. Although many attorneys charge several thousand dollars for a package of living trust documents, we at Marin Law Center can provide the whole package for around $1,000. This includes meeting with you, drafting outstanding Living Trust documents, revising them to your satisfaction, and having them executed in our offices. The fee varies, depending on whether the Living Trust package is for a single person ($700) or a couple ($900), plus the initial consultation (usually 45-60 minutes, at $280 per hour) and minor fees for the notarization and recording. Unlike numerous other firms, we include in our fees the preparation of new deeds for your property(ies) in the name of the Trust (as long as they are not too numerous, and in California); recording the new deeds for Marin properties ourselves (and mailing them if they are elsewhere in California); and providing instructional letters for clients to change the names of your bank accounts and other accounts to the name of the new trust. 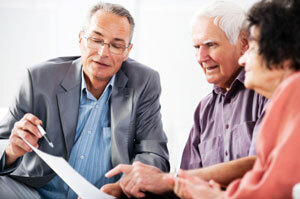 A will has been described as “just a fancy letter to a judge suggesting how you’d like to have your property distributed after you’re gone.” However, if you only have a will and not a trust, the estate is required to be probated, and in that process a judge still has to approve your request, which involves a surprisingly large amount of paperwork on the part of your executor and the attorney, as well as attorney fees, many months (including too many hours spent with an attorney), and having it all be a public record. A Living Trust avoids all of that. Your assets all become owned by your trust, with you as the trustee, in complete financial control until you’re gone (or incapacitated), at which time a “successor trustee” (usually your child or children or other heir or heirs) takes over and distributes the assets as you have set forth in the trust, all without the involvement of the courts, judges, or in most cases, attorneys. The process starts with an initial consultation with an attorney here. In that consultation, the attorney answers all your questions and fills out a questionnaire, gathering the basic information for your trust and the other documents. After the initial drafts of the documents are prepared, there are usually one or two subsequent drafts which go back and forth in the following weeks, because rarely have people made up their minds on all the details when they first come in. Ultimately, all the blanks are filled in and you feel the final result truly represents your wishes. The other documents in the package, besides the trust itself, include a "pour-over" will for each person (which "pours over" into the trust every asset not already listed in the name of the trust or on the attached schedule of assets, but which does not need to be probated), and two Durable Powers of Attorney: one each for finances and for health care (this latter document is sometimes known as a Living Will, or an Advance Directive for Medical Care). These appoint people of your choosing (known as "attorneys in fact") to make decisions for you in case you become incompetent, such as when you are in a coma or become senile). It is true that all these documents are rather more complicated than a simple will, but you are buying peace of mind in the knowledge that your affairs are truly in order. Your loved ones will not have to suffer through the time and expense of probate (or conservatorship, in the case of incompetency). Who wouldn’t want that better night's sleep, and the savings of tens of thousands of dollars as a result? You can start by calling Marin Law Center at 472-4400 for an appointment. © 2005 - 2019 Marin Law Center. All Rights Reserved.